Perhaps after I finally get over my Japan hangover and I'd stop daydreaming about sushi and gyoza, I would go back to my all-time favorite comfort food -- pasta and pizza. These two have never failed in putting me in a happier mood especially on a very challenging day. I remember how Mommy would make it a point to cook pasta every Monday as she knows that this is definitely not our favorite day of the week. Also, Pan and I have this tradition of ordering our favorite thin-crust pizza during finals week which we would enjoy as an afternoon snack while reviewing for our exams. So, when my good friend D suggested that we go check out Marco Marco in Circular Road after our indoor cycling class one time, I was so game! 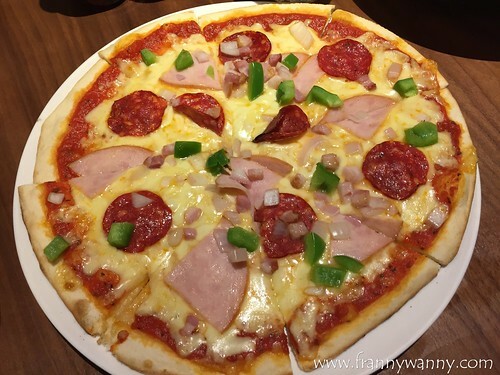 Marco Marco actually has several outlets all over Singapore and it's a casual dining restaurant that offers a wide array of pasta dishes and pizza flavors to suit everyone's discriminating taste. Each flavor is named after a city or a travel destination so you more or less can get an idea of what it's made off based on the name. 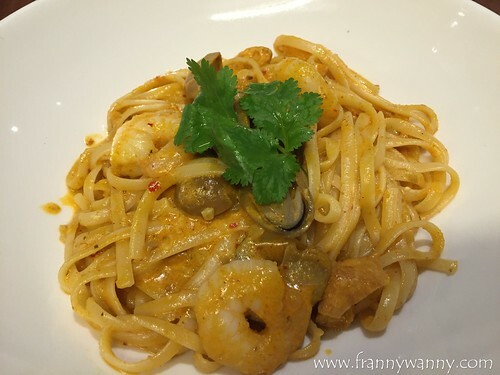 D was raving about the The Singapore (S$15) which is a delicious pasta creation made of plump juicy shrimps, bechamel sauce and laksa cream. It smelled and tasted so yummy! I'm not sure if I was just so hungry after the workout or the pasta was divine that I managed to inhale my food in less than 10 minutes! I'm so glad I took D's advice and ordered this. It was the BOMB and I'll go back for more of this! First was The Palermo (S$17) which D highly recommended. It's a thin-crusted pizza topped with ham, mushroom and... wait for it...wait for it.. truffle oil! They surely didn't scrimp on the ingredient as our corner in the restaurant was instantly filled with the delicious aroma of truffles as soon as the pizza was brought to our table. The crust had a very chewy, bread-like texture. It's good but it feels way too homemade. It reminds me of all those oven-baked pizza that I would get from our school canteen. 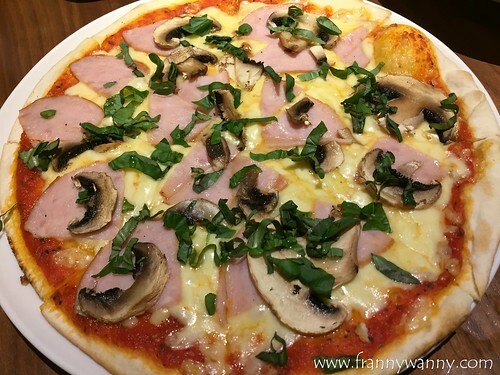 Secondly, we tried The Melbourne (S$17) which is their take on an all-meat pizza. Of course the boys loved this! Surprisingly, I thought it was pretty good too considering that I'm not a fan of pepperoni on my pizza. Yes, I know.. another weird food fact about moi. This pizza was topped with pepperoni, ham and bacon. You'll surely get a good amount of meat in every bite. Like what I've mentioned earlier, Marco Marco is a fun and casual dining place that's perfect for groups of friends to hang out in after a long busy day at work. I love that the menu is very straightforward and simple plus the price was very reasonable too. Will I go back? DEFINITELY! I'm definitely having more of The Singapore pasta plus I can't wait to try the other varieties too. Check out Marco Marco at 23 Circular Road, Singapore. Call them at 6223-5001. They also have branches in Millenia Walk, Novena Square and The Metropolis.